Home » Despicable Media » This is news so why isn’t it news? You would think the emerging story of the most corrupt administration, of the most corrupt 8 years in American history would be big news – at least I would think so. As to this reporter’s closing question (which I hope is rhetorical), What is in the memos and why is this being hidden from the public?, click the link for the answer and then ask yourself, why isn’t that news? The answer to the ‘why’ question is obvious of course, what is not so obvious is how so many can be that corrupt that they can either believe what they are reporting, have so little conscience or actually be as stupid as they come off . This is yet another inconvenient fact that the media and Democrats don’t want to discuss. The entire FISA court basically was full of Obama appointees. The one Trump apoointee to the FISA court also replaced an Obama appointee named Susan Webber Wright who’s term expired May of 2016. Keep an eye on the story about Rudolph Contreas though. That’s the big story that everyone seems to be missing from this memo release. Corruption at the judge level is even more frightening than corrupt DOJ and FBI hacks. 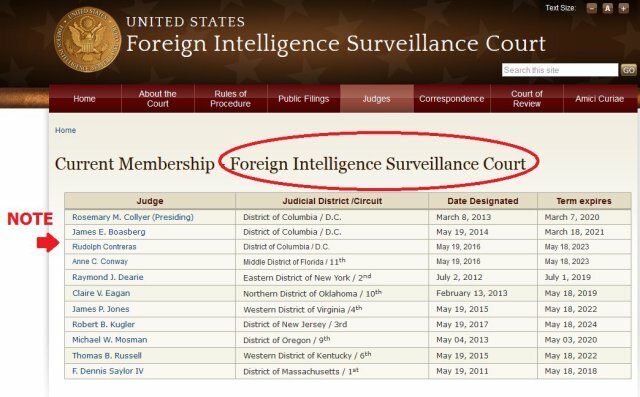 The Obama team’s actions with the FISA Court were not just corrupt – they were criminal! Now his appointed judges are in the news for suspect deep state actions. Chief Justice of the United States. Each judge serves for a maximum of seven years and their terms are staggered to ensure continuity on the Court. In addition, the entire FISA court in late 2016 was stacked with Obama appointees. The entire court as of March 2017 was Obama appointees. 3. On Friday another Obama appointed FISA Court judge, U.S. District Judge James Boasberg sided with the Department of Justice after multiple news organizations, including CNN and USA Today, sued for the public release of Comey’s memos after their Freedom of Information Act requests were denied. The fact that any judge would currently side with this corrupt Department of Justice is suspect. What is in the memos and why is this being hidden from the public?